Designing storage for enterprise applications such as databases, mail servers, and VDI involve benchmarking various storage devices during proof-of-concept (POC) phase. One of the intents of the POC is to evaluate behavior of storage under various load conditions, against various I/O profiles that are supposed to represent / simulate the actual applications. The storage that stands out during the benchmarking will be a prime candidate for consideration. In 2009, a blog was published on microsoft.com that attempted to disclose the I/O profiles of many enterprise applications. Although, this information is much better than random guesses, it does not capture all the phases of an application. Benchmarking with these profiles may result in selection of a storage that is sub-optimal to handle all the needs of an application. Various storage vendors have published their perceived view of the applications and are recommending certain IO profiles to use during a benchmark. A few vendors have started relying on Infrastructure-level analytics to learn about the behavior of various applications as viewed by their storage devices and started publishing the learnings (on their cloud portal and blogs). Using these machine learnings is certainly a good start. One of the most important characteristics of an application’s I/O is the block size it uses when moving its data. My colleague Pete Koehler has done a very nice job of explaining what it is and why it matters in his blog. He also explains how one can get the information needed to understand the I/O profile of an application in this blog. As part of my day-to-day work, using the methods Pete explains in his blog, I have extracted the I/O profiles of many applications you run in your data centers. I thought these profiles can be useful to all those who benchmark their storage systems, but want to do so with realistic I/O profiles, understand their applications, or want to just look at some cool graphs. After looking at the profiles of all the above applications, one thing you will hopefully realize is that there is no one size fit all option when sizing storage for these applications. I know what you will be thinking after reading this – damn it! what should I use to benchmark my storage? I will try to summarize my findings and specify separate profiles that mostly closely resemble the profile of each application. But, more importantly, I want to educate the good folks who are tasked to run POCs to not fall for the blind recommendations that are no where close to reality, but to understand their applications using the tools that can help them do so and benchmark their storage based on what they learn. The sudden explosion in the number of solutions built on flash-based storage surprises me. I remember researchers and industrial community discussing the reliability and longevity of Solid State Disks (SSDs) in FAST conference not too long ago. Fast forward today, these no longer seem to be something that worries the solution providers or the consumers. I now work for PernixData, a company that is aiming to carry forward the virtualization journey from where hypervisors left off (post CPU and memory virtualization). Flash Virtualization Platform (FVP), the flagship product developed by PernixData is a clustered flash tier created by virtualizing server-side flash storage for accelerating virtual machines’ (VM) I/O access to the block-based storage devices. In this blog post, I intend to discuss the motivation behind developing FVP and the key benefits it offers. Over the years, storage technology has taken an interesting course. Although, computing platforms (desktops, servers, laptops) provide persistent storage to the computing units, most IT users don’t trust this layer to be robust enough to provide either the performance that meet their SLAs or the technologies that let the data rest in peace (dedupe, compression, encryption, snapshot). As a result, a new storage layer with dedicated expertise to accomplish both, but is external to the computing platform, has emerged. Almost all research efforts in the storage area continues in this external tier. However, this external storage tier is plagued by a problem – improving a single layer in two orthogonal dimensions (performance and capacity) is extremely complicated. Storage for most data centers are sized in two dimensions – capacity and performance. 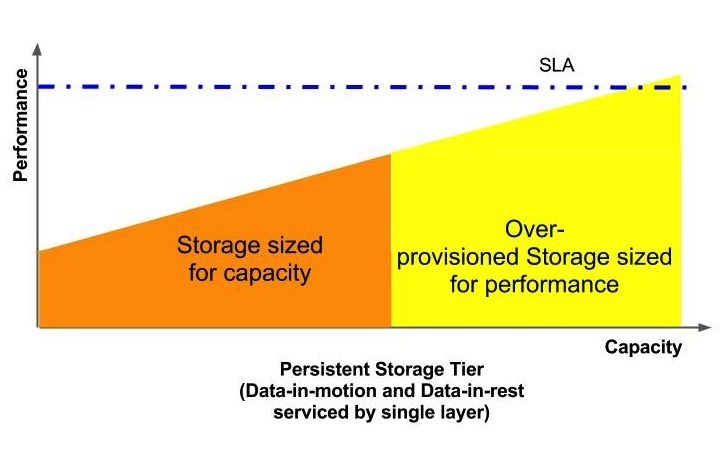 Most often, storage sized for capacity doesn’t meet performance needs (Application SLAs). In that case, additional storage media have to be added to meet the performance needs (this is mostly true for transaction based applications). With advances in media capacity out-racing advances in media performance, this almost always lead to over-provisioning as adding storage media means adding extra giga and terabytes of unused storage capacity. There is a significant ‘Capex’ implication of sizing the storage this way. Another complication may arise, when almost all processing cycles of the storage has to be dedicated to process application I/Os to meet their SLA. This leads to postponing all non-application traffic (mostly administrative in nature such as snapshots, backups, storage cloning, migration etc.,) to idle periods. This means that either storage admins have to depend on heavy automation and scheduling of these tasks OR burn mid-night oil to ensure the success of these operations. This has significant ‘Opex’ implications. In summary, meeting performance requirements requires capacity to be over-provisioned, sticking to capacity needs compromises performance. Hence, it is very hard to expect the convergence of both. Where is the local storage? What happened to the local storage? Applications that effectively use local storage can be counted with fingers – Hadoops, High Performance Computing applications, the Googles, the Facebooks to name a few. But, they take a different approach to utilize the local storage capacity. They implement all the afore-mentioned capacity and resiliency features in software using commodity hardware. To obtain the performance their application need, they use a ridiculous amount of hardware that average business can’t even imagine. Don’t forget – they can throw many engineers with specialized expertise to solve the bi-dimensional problem. Finally, there are industry-standard benchmarks such as TPCs that can use local storage for reducing the cost of performance. Here, data protection at the hardware level is not given a high priority. The lack of interest and demand have largely limited innovations in the local storage tier – except improvements to the media types. Server vendors are now supporting SAS/SATA/PCI-e based Solid State Disks (SSDs) along with traditional SATA/SAS magnetic disks. But the concern remains – who will use them? Meanwhile, another revolution happened in the IT industry. VMware, with its flagship product vSphere, fork-lifted compute layer from the storage layer. This opens up interesting opportunities. One such opportunity is to solve the problem I have been discussing all along – to split storage tier into two separate dimensions – Performance and Capacity. PernixData is one among the early few who recognized this opportunity. Result of their tireless effort is what you see today – Flash Virtualization Platform, an ethereal storage layer that uses local fast storage (SAS/SATA/PCI-e SSDs) to accelerate transient data and SAN storage to rest persistent data. FVP aims to glue the orthogonal challenges that plague the storage layer by intelligently using the two storage tiers. This independent usage of the two tiers leads to plethora of opportunities for the server and storage vendors. Server vendors can focus on providing high-speed, local storage for servicing transient data while not worrying about the complicated data-resting technologies. While, storage vendors can focus on jazzing up their storage devices with attractive capacity-saving, data-protection technologies while not worrying about the performance impact of these technologies. Essentially, FVP lets you use storage solutions from your preferred vendor while speeding up data access by utilizing the best flash technology out there. Let us revisit the problem. 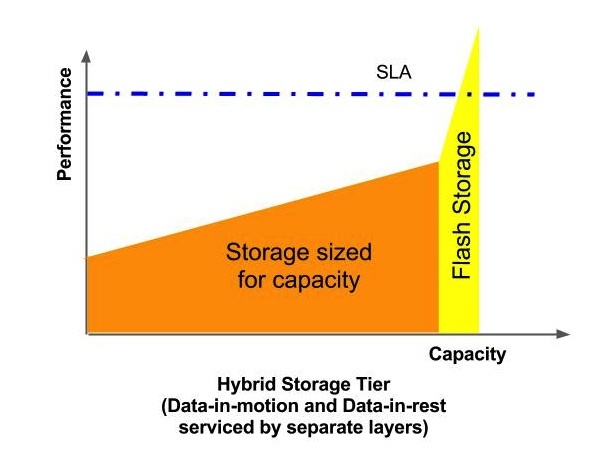 When the persistent tier (external storage) is combined with the transient tier (Flash media in the local storage), a new solution emerges that can allow sizing of persistent tier to meet the current capacity requirements (and room for growth), while allowing the transient tier to use the latest technologies in flash to adequately meet the I/O performance demands by absorbing any burst of I/O requests from the applications at the moment it occurs. Even if an emergency administrative task has to be scheduled, application users wouldn’t experience any noticeable impact as the I/O request is serviced by the transient tier. How does FVP achieve this? Check out the videos here. This solution has significant capex savings as the persistent storage doesn’t have to be over-sized. The only additional investment will be for procuring flash media (cost keeps reducing every day) and the license cost of FVP ;-). There is noticeable opex savings as well – no need to maintain the extra storage (power, space and cooling savings). Storage admins can breathe easy as the admin tasks they have to execute on the external storage is hidden from the application users and the impact is mostly not felt. ‘Pernix’ means agile, active. The name is very apt for what FVP can do to your IT environments; it can activate your virtual machines. Think of it as the magical spinach that gives Popeye his awesome power. “Protect your investment, Pernix your data”. As Satyam (CTO, PernixData) likes to ask – do you want to get ‘Pernix’d?. I do. That’s why I decided to join the team. Questions is – Do you? If the answer is yes, join the beta program today.